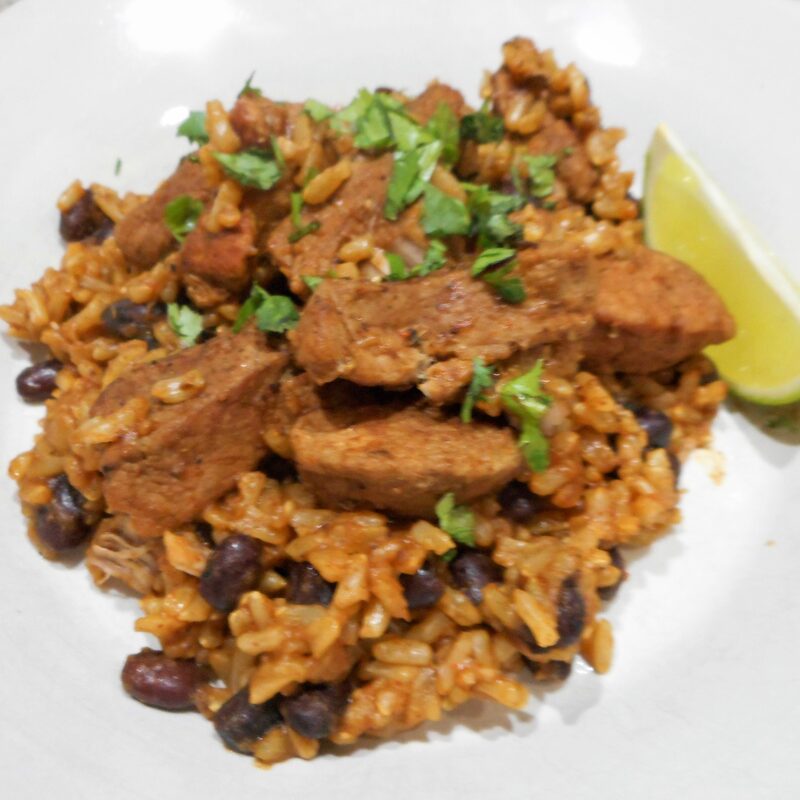 This meal in a pot features Cuban style spiced pork nestled into rice and beans. A green salad on the side would round out your dinner. Be aware that the timing could vary depending on the make and size of your electric pressure cooker. While the whole dish can be prepared in the cooker, I prefer to first brown the meat in a cast iron skillet. 1. In a small cup or bowl, combine the salt, pepper, and garlic powder. Sprinkle the spice mix evenly over the cubed pork. 2. Heat the oil in a heavy skillet. Working in batches, add the pork and brown. Remove the pork to the pressure cooker insert. 3. Stir in the broth, orange juice, taco seasoning mix, garlic and cumin, mixing well. Stir in the beans and rice. 4. Secure the lid, set pressure to high, and cook 25 minutes. Unplug the pressure cooker and let stand 10 minutes before venting to release the pressure..
5. Stir in the lime juice and top with cilantro. Serve with salsa if desired.